Statistics : distance: 23.6 miles/ 37.8 km , steps: 50,034. elevation climbed: 1,470 feet weather: sunny 80. I stayed l last night in someone's basement since all the gites were pfull. Clean up all my spread out stuff, organize it into piles . Then put each pile in a ziplock bag. Toss the ziplock bags into the hiking backpack. Hoist the backpack on my shoulders. Make some qminor adjustments. Turn off the lights. Walk out the door. Grab my clothes which are still moiwashing. Today the plan is a short 10 km walk to the Gite Paradise in Larceveux. I walk until I reach a Refugio from the 1600s. I meet an older couple eating some snacks. The Refugio masonry joints have been repointed And a new roof. Is 9 o'clock in the morning. I should've seen the Paradise Gite on the way to here. I backtrack for the next two hours looking for this Gite. this is where I am supposed to meet Clive and Maya Cowell tomorrow. It is The only option since Ostabat is full. After two hours of walkingI have a resident where it is it is. He calls the phone number there's no answer. He calls his neighbor and she says come over and I will show you where it is. Go over to her house she points out which house i am looking for. It is now early afternoon I head over to the house. There's no one home. Sit on the grass think about what I'm going to do now. 10 minutes later the neighbor shows up. She says that the Gite will not open today. 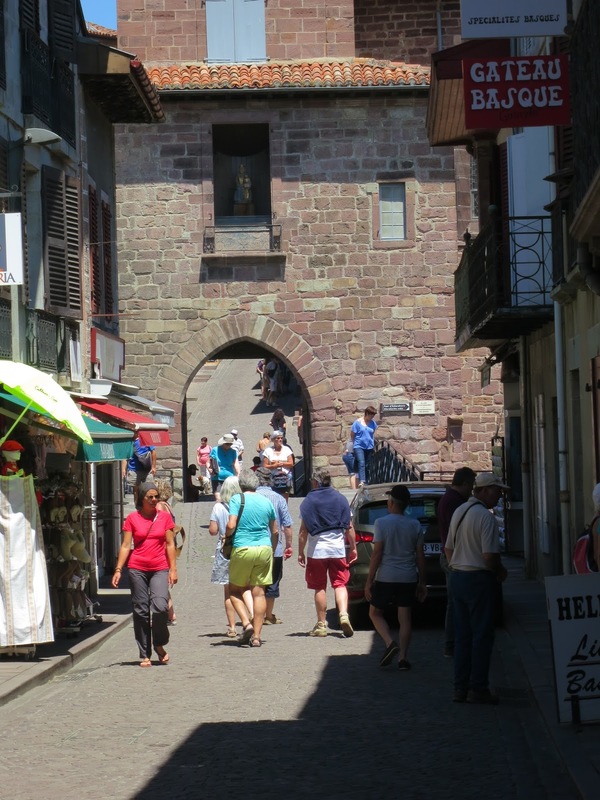 She says my only option is head on into St Jean Pied de Port. It is 3 o'clock and it is a 15 km walk. It should take me 4 hours I tell her .thank you and have a great day. I start walking. After about an hour of walkingI have two choices walk down the highway or a meanderinig path. I I Choose the road. I put on my headphones and turn up the music and start walking on the road. When the song "walk this way” by run DMc and aerosmoth starts playing, I just can't help but to start dancing, before the song ends two cars honk their horns in support. I get motivated and keep dancing for another 10 kilometers. I have a feeling of satisfaction in the sense that i did something I did not think I could do. And I didn't need to change the rules. I didn't take more medicine that my prescription. I didn't use a bicycle. I didn't receive any outside help. I did it myself. . It's a beautiful moment. I had done to the Gites to look for one to stay st and see if there any friends in Town. I run into Harry and Bridgette Slinkman. And I run unto Marie. She is the person that I ruan into the most on this walk. I ran to her at Conques, Decazeville, Limoney, Cahor, Ostabat and St Jean Pied de port. Days later she sent me a text wishing me a happy birthday and a good trip to Italy. I told her to stop stalking me LOL.